A metamorphic rock, gem material, and mineral pigment that obtains its blue color from the mineral lazurite. Lapis Lazuli Gemstones: As a general rule, solid blue lapis or solid blue with a few grains of gold pyrite are the most desirable colors. In the photo above the bottom two cabochons approach that ideal. The large cabochon on the top right has a few thin veins of calcite and some calcite mottling. This stone is attractive and some people might prefer it, but the calcite reduces its desirability for most people. The top left cabochon has large patches of calcite that are intergrown with blue lazurite to yield a faded denim color. It also contains many visible grains of pyrite. For most people, it would be the least desirable stone in the photo; however, some people will enjoy it. Desirability in lapis varies from stone to stone and from person to person. Unlike most other gem materials, lapis lazuli is not a mineral. Instead, it is a rock composed of multiple minerals. The blue color of lapis lazuli is mainly derived from the presence of lazurite, a blue silicate mineral of the sodalite group with a chemical composition of (Na,Ca)8(AlSiO4)6(S,Cl,SO4,OH)2. Lapis Lazuli - The Rock: This photo shows a specimen of marble in which small patches of lazurite and abundant crystals of pyrite have formed. 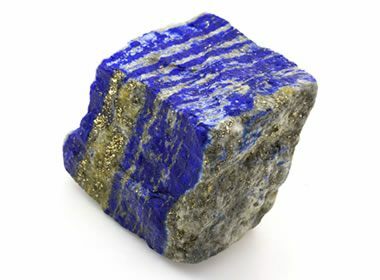 This is a beautiful rock specimen, but its usefulness as a rough for cutting high-quality lapis lazuli cabochons or beads is limited because the amount of lazurite present at any location within the rock is lower than optimal. However, this type of rock can be dyed to look like reasonable quality lapis. This image copyright iStockphoto / Epitavi. Lapis lazuli forms near igneous intrusions where limestone or marble has been altered by contact metamorphism or hydrothermal metamorphism. In these rocks, lazurite replaces portions of the host rock and often preferentially develops within certain bands or layers. Afghanistan is the world's leading source of lapis lazuli. Some parts of the country have been actively mined for thousands of years. Other countries that produce notable amounts of lapis lazuli include Chile, Russia, Canada, Argentina, and Pakistan. In the United States small amounts of lapis lazuli have been produced in California, Colorado, and Arizona. Classification A metamorphic rock that contains enough of the mineral lazurite to impart a distinct blue color. It may also contain significant amounts of calcite, pyrite, and minor amounts of other minerals. Color Blue. Often with white calcite veining or mottling, and gold grains of pyrite. Luster Dull, but polishes to a bright luster. Cleavage None, though it may split easily along foliation or calcite veins and layers. Mohs Hardness Varies between the 3 of calcite and the 5 to 5.5 of lazurite. Not well suited for use as a ring stone or in bracelets. Diagnostic Properties Blue color, association with pyrite, and hardness. Uses Cabochons, beads, carvings, spheres, inlay, and pigments. Banded Lapis: A piece of rough lapis lazuli showing distinct calcite banding and pyrite on a fracture face. Image copyright iStockphoto / J-Palys. In addition to lazurite, specimens of lapis lazuli usually contain calcite and pyrite. Sodalite, hauyne, wollastonite, afghanite, mica, dolomite, diopside, and a diversity of other minerals might also be present. To be called "lapis lazuli," a rock must have a distinctly blue color and contain at least 25% blue lazurite. Calcite is often the second most abundant mineral present in lapis lazuli. Its presence can be very obvious, appearing as white layers, fractures, or mottling. It can also be finely intermixed with lazurite to produce a rock with a faded denim color. Pyrite usually occurs in lapis lazuli as tiny, randomly spaced grains with a contrasting gold color. When abundant, the grains can be concentrated or intergrown into distinct layers or patches. It can occasionally occur as a fracture-filling mineral. As a rock, lapis lazuli is composed of several minerals, each with its own hardness, cleavage/fracture characteristics, specific gravity, and color. Hardness ranges from a Mohs 3 for calcite to the 6.5 of pyrite. The hardness of the material depends upon where you test it. 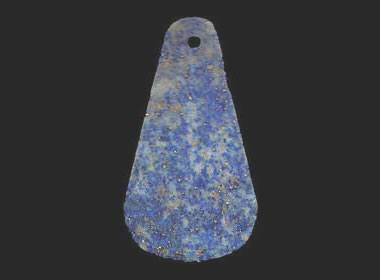 Ancient lapis pendant: A Mesopotamian pendant made of lapis lazuli, c. 2900 BC. Public domain image by Randy Benzie. Lapis lazuli has been popular through most of recorded human history. Mining for lapis occurred in the Badakhshan Province of northeastern Afghanistan as early as 7000 BC. The lapis was used to make beads, small jewelry items and small sculptures. These have been found at Neolithic archaeological sites dating back to about 3000 BC in Iraq, Pakistan, and Afghanistan. Lapis lazuli appears in many Egyptian archaeological sites that date back to about 3000 BC. It was used in many ornamental objects and jewelry. Powdered lapis was used as a cosmetic and a pigment. In Biblical times the word "sapphire" was often used as a name for lapis lazuli. For that reason, many scholars believe that at least some of the references to sapphire in the Bible are actually references to lapis lazuli. Some modern translations of the Bible use the word "lapis" instead of "sapphire." Lapis lazuli started to be seen in Europe during the Middle Ages. It arrived in the form of jewelry, cutting rough, and finely ground pigment. Today lapis lazuli is still used in jewelry and ornamental objects. As a pigment it has been replaced with modern materials except by artists who strive to use historical methods. 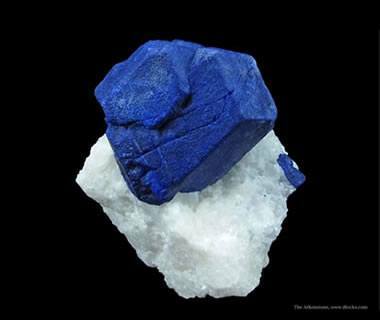 Lazurite Crystal: A crystal of lazurite on marble from Badakhshan Province, Afghanistan. The specimen is about 3.1 x 3.1 x 1.5 centimeters in size. Specimen and photo by Arkenstone / www.iRocks.com. Lapis Lazuli as a "Conflict Mineral"? 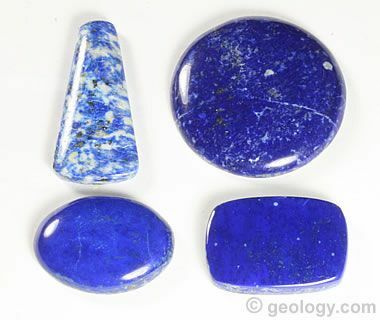 Afghanistan has been one of the world's primary sources of lapis lazuli through most of recorded history. Most of the country's production comes from thousands of small mines in the Badakhshan Province. This is an area with a destitute economy, where opium poppy growing and gemstone mining are the only important sources of outside revenue. Much of the area where the lapis lazuli mining occurs is occupied by the Taliban and local members of the Islamic State. They operate illegal mines, attack other mines to capture their production, and demand protection payments from intimidated mine operators. Revenue from these activities is used to fund war and terrorism. Numerous advocacy groups and some members of the Afghanistan government would like to see Afghanistan's lapis lazuli classified as an international "conflict mineral." This would require the country's government to track the production and sale of lapis lazuli from mine to market. It would also involve an international effort to keep illicit lapis lazuli from being traded. The Kimberly Process, used for tracking the flow of diamonds, would serve as a model for the tracking of illicit lapis lazuli. Lapis and Turquoise Necklace: Lapis lazuli and turquoise beads in a necklace with sterling silver. 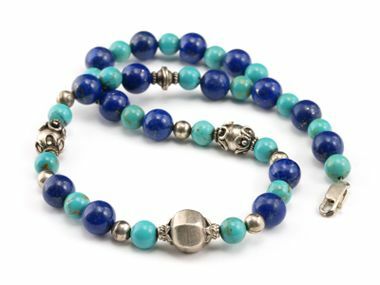 Lapis lazuli and turquoise are a common pairing in beaded jewelry. Image copyright iStockphoto / Alexander Kuzovlev. Lapis lazuli is most widely known for its use as a gemstone. It is a popular material for cutting into cabochons and beads. It is also used in inlay or mosaic projects and often as a material for small sculptures. These uses made lapis the most popular opaque blue gemstone. Although personal preferences vary, the most popular lapis has a uniform, deep blue to violet blue color. Many people enjoy a few randomly placed grains of gold pyrite or a few fractures or mottles of white calcite. However, when pyrite or calcite is present in more than minor amounts, the desirability of the material and the value are significantly lowered. Gray inclusions or mottling also quickly lowers desirability. Lapis lazuli has some durability problems that limit its suitability for certain uses. Lapis has a Mohs hardness of about 5, which makes it very soft for use in a ring, cuff links or bracelet - especially if the top of the stone is raised above the top of the setting or bezel. In these uses, lapis will show signs of abrasion with continued use. 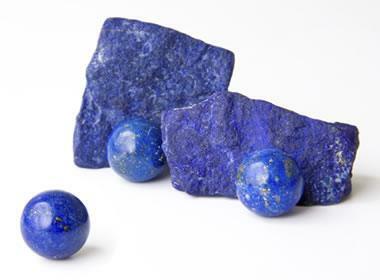 Lapis is best used in earrings, pins, and pendants, where abrasion is less likely to occur. When stored as unmounted stones or in jewelry, lapis can be damaged if the pieces are not isolated from one another. Jewelry is best stored in separate boxes or bags, or in trays with separate compartments for each item. Loose cut stones should be stored in separate papers, in bags, or in gem containers where the stones will not rub or abrade one another. Lapis Lazuli Spheres and Rough: Small blue spheres of lapis lazuli shown together with two pieces of high-quality, solid blue untreated lapis rough from Afghanistan. The spheres are approximately 14 to 15 millimeters in diameter. Image copyright iStockphoto / RobertKacpura. Lapis lazuli is frequently treated after it is cut and before it is sold as finished gemstones, sculptures, or ornaments. Lapis lazuli is slightly porous and that allows it to accept and hold dye. Much of the material that enters the market has been treated with a blue dye to remove the visibility of white calcite. It is then frequently treated with wax or oil that improve the luster of polished surfaces and seal the dyed calcite. Ultramarine Pigment: Photo looking down into a small jar of ultramarine pigment made from finely ground and beneficiated lapis lazuli. High-quality lapis lazuli has been used as a mineral pigment for over 1,000 years. Bright blue pieces of lapis are trimmed of impurities and ground to a fine powder; the powder can then be mixed with oil or another vehicle for use as a paint. 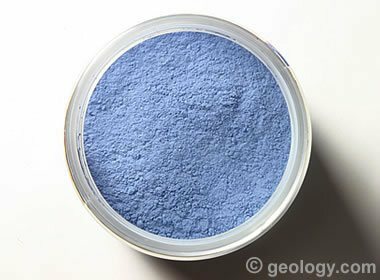 Higher-grade pigments can be produced by washing the powder with mild acid to remove calcite and dolomite that dilute the blue color. The material is then processed to remove grains of pyrite and other foreign minerals. This lapis-derived pigment was named "ultramarine blue," a name that has been subsequently used for hundreds of years. During the Renaissance and into the 1800s, paintings done with ultramarine blue were considered to be a luxury because of their high cost. 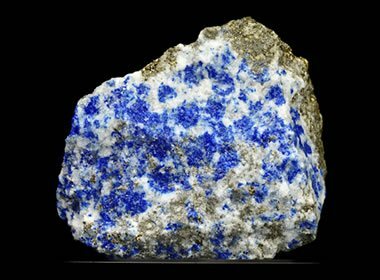 High-quality lapis lazuli was mined in Afghanistan and transported to Europe to manufacture ultramarine blue. This costly pigment was normally used by only the most accomplished artists and those who had wealthy clients to support the additional expense. Ultramarine blue made from lapis lazuli is one of the few natural pigments with a permanent and vivid blue color, good opacity, and high stability. It has always been very expensive and today can sell for over $1,000 per pound. Starting in the mid-1800s, artists and chemists began developing synthetic blue pigments for use as alternatives to ultramarine blue made from lapis lazuli. Some of these pigments also bear the name "ultramarine." An artist who wants an ultramarine pigment made from lapis lazuli today must be sure that the pigment is not synthetic and is actually made from lapis lazuli. Synthetic ultramarine pigments have their advantages. Their blue color is usually deeper and more consistent than traditional ultramarine, and they also cost far less. Today, because of cost, very little ultramarine made from lapis lazuli is used, mainly by artists who are striving to learn historical techniques or achieve results similar to master painters of the past. It is prepared by a few pigment manufacturers who continue to use lapis lazuli from the historical sources in Afghanistan. Paintings Done With Ultramarine Blue: Four well-known paintings done using ultramarine pigment. 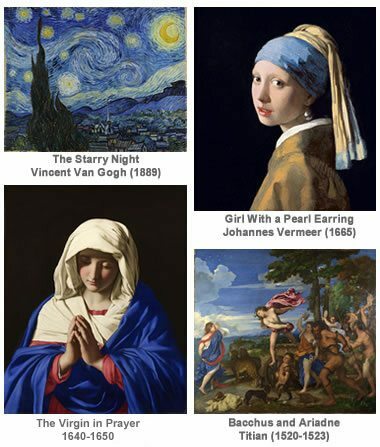 Clockwise from top left: The Starry Night by Vincent Van Gogh; Girl With a Pearl Earring by Johannes Vermeer; Bacchus and Ariadne by Titian; and, The Virgin in Prayer by Sassoferrato. All images are in the public domain and were obtained from Wikimedia.org. A few master painters (examples of which are provided below) considered the use of ultramarine and other costly pigments an essential part of producing paintings with optimum color. Vincent Van Gogh (1853-1890) used ultramarine to paint The Starry Night in 1889. The oil on canvas painting is considered to be one of his best works and is today in the collection of the Museum of Modern Art in New York City. It is a widely recognized painting. Johannes Vermeer (1632-1675) used ultramarine to paint the headscarf of the Girl with a Pearl Earring in about 1665. The oil on canvas painting has been exhibited at museums throughout the world, and also served as the inspiration for a novel and a film. It is currently in the collection of the Mauritshuis in The Hague. Titian (1488-1576) used ultramarine blue to paint the dramatic sky and draperies in his oil on canvas painting of Bacchus and Ariadne. The painting is now on display at the National Gallery in London. Many painters have used ultramarine blue to paint the robe of Mary, mother of Jesus. Giovanni Sassoferrato (1609-1685) produced one of the most vivid examples when he painted The Virgin in Prayer between 1640 and 1650. The oil on canvas painting is on exhibit at the National Gallery in London.